The Tivoli is located in the small town of Buckley in North East Wales. The original Central Hall was built in 1880 and was used to show ‘the new’ silent films as well as being home to a host of travelling showmen. The hall was demolished in 1920 and, in 1925; the Tivoli Theatre (Buckley Picture House Ltd) was built on the same site – an extension of almost half a century of amazing history. The current venue has undergone a number of transformations over the past 90 years, but despite all its makeovers the old cinema (or as we call it ‘The Theatre of Dreams’) is still untouched, retaining all its original early 20th Century features, even after the fatal fire in the mid-1940s. Interestingly, much of the damage caused by the fire has not been repaired, giving parts of the building an intimidating appearance and an often unnervingly chilling atmosphere. The Tivoli has hosted many bands over the years, including the legendary Black Sabbath and Led Zeppelin in the early ‘70s, and many Britpop bands, including Oasis, in the ‘90s. Whilst it remains to this day a well-loved and popular venue visited by many famous artists, never be mistaken when you walk through these doors…this is no ordinary rock concert! There are numerous tales of friendly and sometimes malevolent ghosts and spirits who reside in and walk through the building and a high level of ‘paranormal activity’ has already been recorded – independently and in-house. You can be in the old cinema/theatre, the dressing rooms, the cellar, the stage area and even the offices and know someone is always watching you (and we don’t mean via CCTV!). You are never alone at the Tivoli! Tivoli Staff – past and present (and visiting mediums and ghost hunters) – all have their own individual stories to tell about their own extraordinary and unexplainable experiences in different parts of the building. 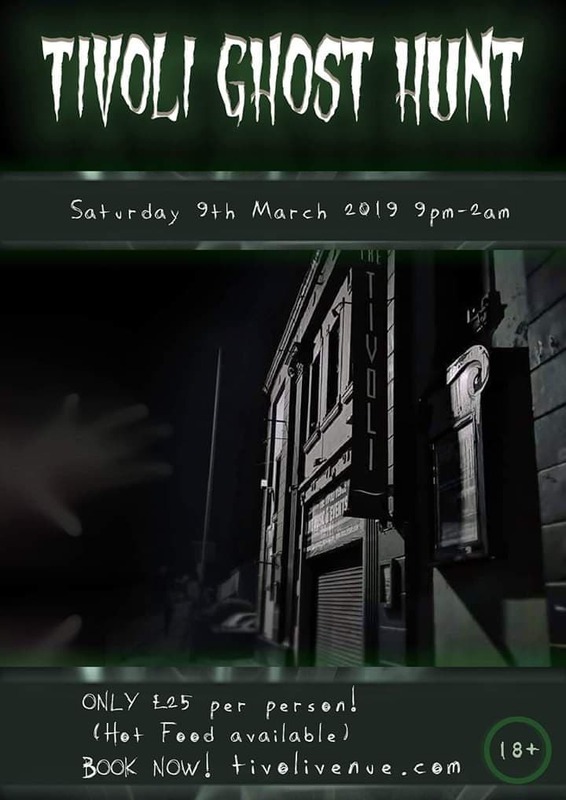 But WE want to know what YOU think… Come and join us in our Tivoli Haunting Ghost Hunts… if you’re brave enough??? In the first 5 months of 2015, and recognising what we believe is its unique attraction, the venue and the Team have appeared on Most Haunted, Cuppa TV, Radio Deeside and 60 minutes with!